Manufacturer of fine software trinkets since Fortran was threetran SO THERE! Every night I call home and say "What do you want for dinner?" My lovely wife replies "I dunno. What do you want for dinner?" Both of us having used up our imaginations, this can repeat for a few iterations. We haven't starved to death yet, but there are times we think it could happen. What's needed at the end of the day is robotic stimulation. Something to give ideas to people with fried brains. And so: Wheel of Dinner. A simple website. Fire it up and it suggests a place to grab food. Eventually it'll come up with something you'll enjoy. Just now, this is set up for me to use, but I'm working on ways to expand. Just moved to newer hosting. 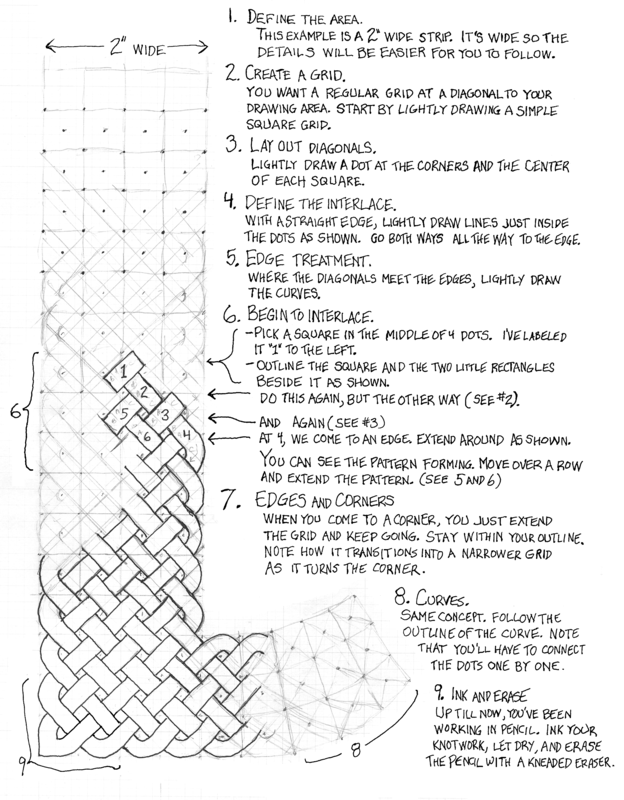 I just finished a handout (3 meg png) for a Celtic Knotwork 101 class I am teaching this Sunday morning. Reed's Knotwork Tutorial at http://mysite.verizon.net/mihaloew/celtic/cel_class.shtml greatly expands on this method but is too big to print as a free handout. Draw Your Own Celtic Knotwork at http://www.thinkythings.org/knotwork/knotwork.html has many more links, including some history and different approaches to constructing knotwork. I'm interested in quite a few things: I'm an avid special-effects geek, an actor, a Webmaster, a writer, an artist, and a songwriter. To pay for all of this, I'm currently employed as an Oracle database developer and occasional DBA by a large company in Phoenix. Though I love the Pacific Coast (especially from the Bay Area northward), a fervent love interest keeps me in Phoenix.